Easily accessible nodes are the bearers of Europe’s future urban system. For the future of the Drecht towns we have examined what place they occupy in the scale of an interregional urban conglomerate extending to the Ruhr and to the Antwerp-Brussels axis. At the moment the focus is on economically programmed inner-city hubs. We foresee that in the future well connected hubs on the border between dense urbanized areas and the big landscapes will play a bigger role in our mobile lives. These landscape hubs will be recreational destinations that can provide access to the green areas in a concentrated way in order to spare the last natural habitats from mass tourism. Within the inter-regional conglomerate, Biesbosch Central Station of all the nodes in the Drecht towns gives access to one of the most important natural areas in this network: the Biesbosch National Park. The Drecht towns link the quality of the rural and urban Netherlands and accommodate both rural peace and urban bustle. 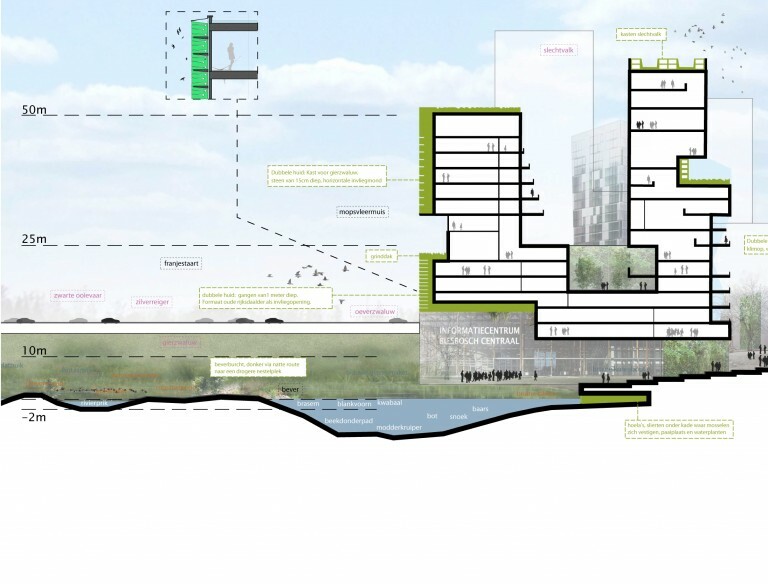 The spatial quality at Biesbosch Central Station is defined largely by the direct relationship between compact building development and landscape, between nature and town. It is an urban transfer point for nature and recreation and is accessible by public transport, car and cycle. From here the boats, cycle and footpaths set off into nature. The green area around Biesbosch Station will be transformed from a buffer zone with playing fields into genuine concentrated landscape. The south side will become a varied landscape with woodland and meadows and will take on the appearance of the adjacent Dortwijk estate. On the north side the land reclaimed from the river will be gradually re-submerged. The primary dike will be shifted in several stages and water will again be given free play. 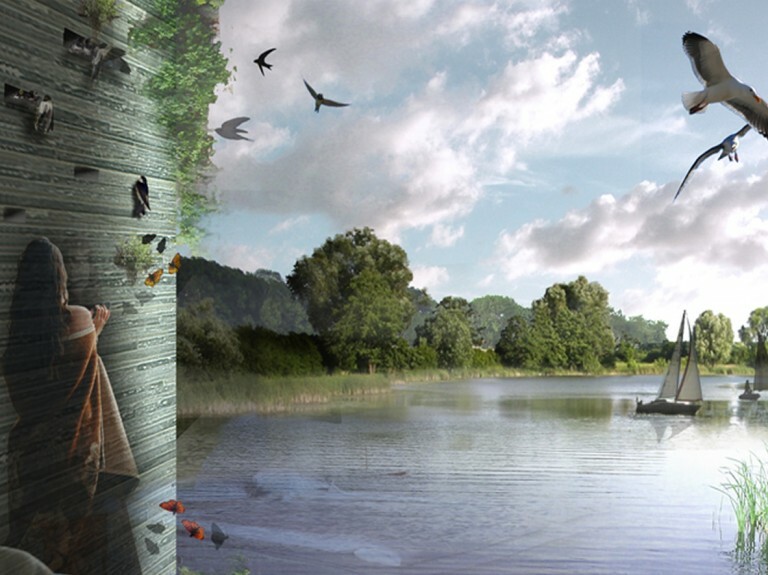 The characteristic Biesbosch landscape will then extend to the walls of the buildings. Walls, roofs and leftover corners will also provide a wealth of nesting places for animals. 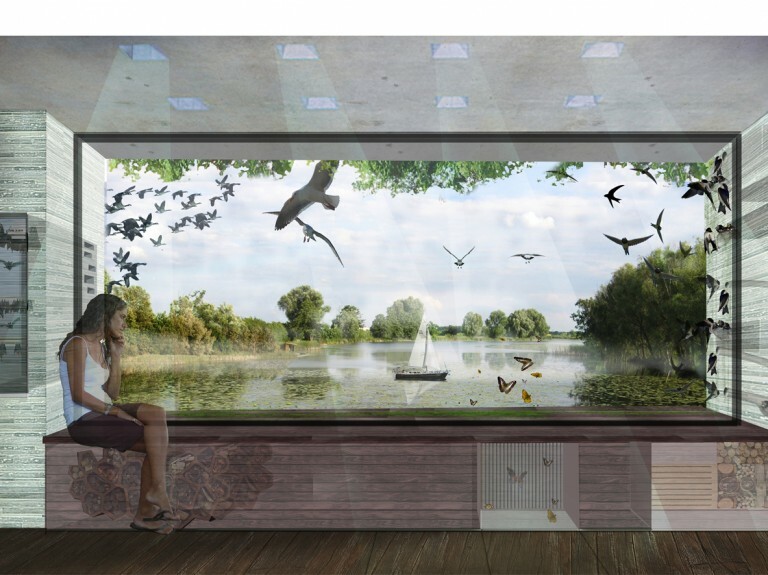 Biesbosch Central Station explores how nature can be combined with dense urban living. A new quality of life is being explored through the introduction of unexpected and spectacular experiences of nature for people and animals. 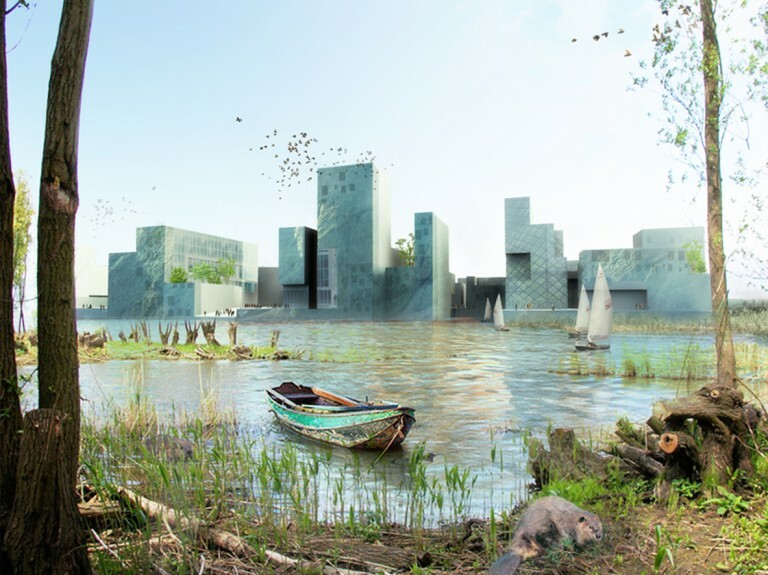 It explores how urban buildings and their surroundings can complement the flora and fauna of the surrounding landscape and how at the same time these elements can provide a conceptual and programmatic framework for the new development. 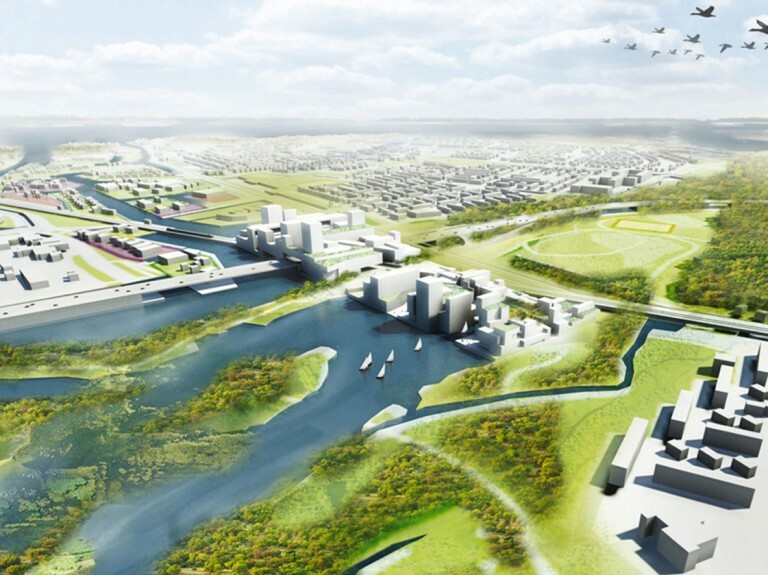 Station Biesbosch is een ontwikkelingsstrategie voor de Groene Zoom bij Dordrecht. 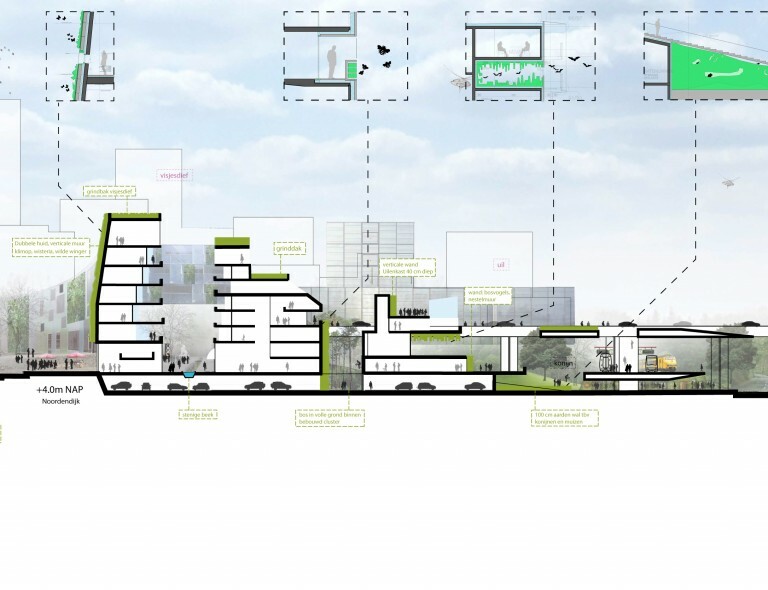 Team DS Landscape Architects – Mecanoo – Royal Haskoning, are designing the new building and outdoor area for Eurojust. De nesteljas is een gevel met geïntegreerde mogelijkheid nestkastjes te plaatsen. The new borough named Achter ’t Holthuis stands on the sport fields east of the village of Twello. The new intervention knits together two existing estates into one big ensemble of forests, fields and lanes. First landscape then architecture is the motto of the process. Park Brederode is a clear example of this design attitude. Biodiversity: nature is our living environment, a long period of separation between nature and mankind finally comes to an end! Meander Medical Centre has been opened at the start of 2014.